Some people think that performing CPR is a job for for paramedics or medical professionals. Others believe CPR is only for those with years of training and extensive experience in medicine. At In-Pulse CPR, we believe that CPR training is for everyone. We don’t take this stance because we want to increase our bottom line. Instead, we are passionate about CPR because we have seen how it saves lives and keeps families from being turn apart by loss. Here are five important reasons why you could consider learning CPR. Many people think of CPR as a skill to have when dealing with elderly or very sick family members. Although this is important, there is no age limit when it comes to who CPR can help. In fact, it’s a great idea for new parents and caregivers of little ones to understand the principles of infant and child CPR. You don’t have to be a genius or complete years of medical school to learn and perform CPR effectively. One of the main benefits of CPR is the fact that it can be performed by just about anyone at any time. 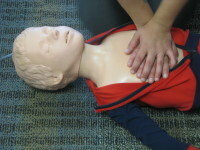 At In-Pulse CPR, we facilitate a variety of CPR classes. Many of our students are surprised to find out how quickly they can master these skills when they study with a patient, experienced instructor. Why not register for a class today? Visit our calendar of community classes in your area and register. You know that it’s important to call 911 as soon as possible when an emergency occurs. This is a vital step, but unfortunately, it’s not always enough. Although emergency personnel send help as quickly as possible, no emergency response is instantaneous. In most cases, brain death starts occurring in as little as four minutes after the heart stops functioning. When you begin CPR right away, you can help the patient minimize the risk of brain damage. Emergencies always seem to occur at the most unexpected times, and they have a way of making you feel helpless and confused. When you complete CPR training, you will have the skills and knowledge necessary to perform CPR in an emergency situation. You’ll also have the confidence you need to make good decisions and do everything possible to help. As of 2016, cardiac arrest is still one of the leading causes of death in the United States. According to national statistics, less than 30 percent of people who experience cardiac arrest outside of a hospital receive bystander CPR. You don’t have to feel helpless when it comes to your response in an emergency situation. Instead, enjoy the confidence and satisfaction that comes from knowing that your CPR skills can be used any day to help save a life.